Last week we learned how to take Criticism Mindfully. This week’s blog journal entry will look at criticism from the opposing end, Giving Criticism Mindfully of course. First, let us addressed the myth that giving criticism is easy. In reality, giving criticism can be quite challenging and requires us to be CLEAR, CALM and HONEST. It is not always easy to deliver the message. There are two key components you should go through when it is time to provide criticism to someone. -Before you say anything, decide exactly what the other person has done that is a problem for you. – Decide what change you want to see and what you want them do or say next. According to old Arabic proverb it suggest three gates you should be able to pass through before you open your mouth to speak: Is it necessary? Is it Kind? Is it true? You should be able to pass through at least two of these gates. So when you think about telling someone that they are a self-centered jerk for ridiculing your coworker, that statement would never pass the “necessary” or “kind” gates although it you may considered it to be true. Check out these 7 tips to assisted with providing a calm and honest way to provide criticism. 1) Consider the time and place – Do you have something to say immediately or can it wait until the person is more likely to listen to you? Sometime it may be best to say something immediately, it may not be appropriate, particularly if other people are around. Give criticism to the person directly, face to face (never on social media such as facebook, Instagram, etc). Show Respect and be respectful! Although you will have to wait for the appropriate time and place, do not let things build up and become worse. Tackle that problem as soon as possible when appropriate. 2) Focus on one thing at a time – if you one or more issue, focus on one problem at a time and deal with the most important issue first. Keep the conversation in the present. Do not allow yourself to be dragged into other issues presented by the other person. 3) Focus on the action, not the individual – This is not opportunity to dissect the other person’s every mistake and character flaws. Focus on your specific concern and keep it brief, avoid going on long after you made your point. 4) Be Judgeless and avoid accusing – Do not tell the other person “you do this and you do that.” “You” messages tend to label the other person in a negative way. Practice the use of “I” statements. See previous blog on use of “I” messages. 7) Decide what the next steps will be – If the other person doesn’t do what you want, what will you do? This does not mean issuing threats and punishment, it means deciding what your next steps will be. Make a choice: you can either stick to what you want or decide what will happen if you don’t get it. There is also the option to negotiate or compromise. Rest assured that you made your point and accept that the other person does not agree, let it go and move on. 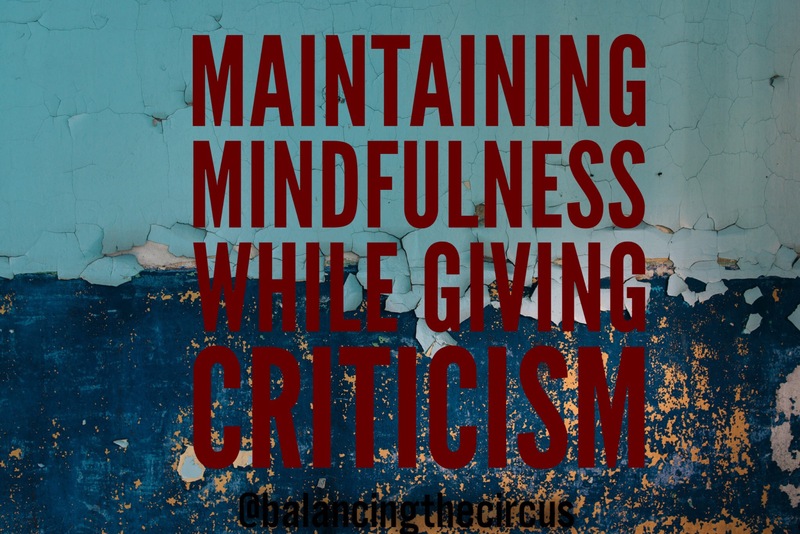 I believe that giving criticism is just as difficult as receiving it, but with these 7 steps it gives us mindful ways of handling a not so easy situation. It is important that we keep relationships in tact (professional, family and friends) and when we lack the tools, it can cause undue stress when communicating in those relationships. Let continue to work toward maintaining connections with others more confidently and calmly more often. When you use this steps, send me a message and let me know how they worked out for you. And if you have any addition suggestion on how you have handle giving out criticism in the past, feel free to share, I would love to hear them. Thank you and let me know if you try some of the suggestions.